I love a nice, quiet Christmas. I think I’m pretty lucky to be born in a family where we don’t really care for gifts. I don’t have to fight the crowds at the mall trying to find gifts for each family member. I also don’t have to travel during the holidays. Well, the fact that my family is from a different culture helps a bit. We had dinner with Mike and Gina. Gina cooked prime rib. I think the last time I had prime rib was more than 11 years ago. 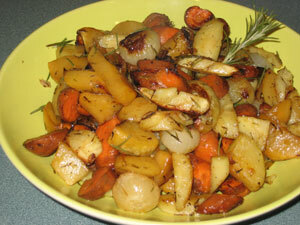 I made roasted vegetables with pearl onions, carrots, parsnips, and rutabagas. I found that sage is too strong for roasted veggies; so, I only used thyme and rosemary this time. It turned out so good. 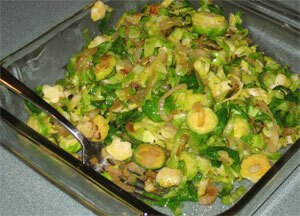 But I was more happy with the Brussels sprouts with caramelized onions that I made. I may sound like a dork, but I have never made more beautiful caramelized onions! The key is not to stir (well, I stirred it once). It was such a fluke. I was busy washing and chopping the Brussels sprouts. 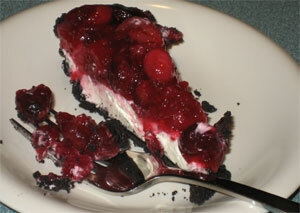 And for dessert, we had cranberry chocolate tart (with crytalized ginger and creamy Mascapone cheese….mmm). It was the most easy dessert I have ever made. That is a cute movie, but the book is excellent, and being a Gaimon, not nearly as predictable.